It’s official: We’ll have a Nashville MLS expansion team in coming seasons, as the league, owners and elected officials unveiled the 24th Major League Soccer squad at a Country Music Hall of Fame and Museum event today. The team will be owned by Nashville Soccer Holdings, LLC, led by John Ingram of Ingram Industries; and includes Minnesota Vikings (NFL) owners Mark, Zygi and Leonard Wilf; and the Turner Family of Nashville-based MarketStreet Enterprises. What’s not clear is when the expansion team will begin play, as MLS officials acknowledged. LAFC begins play in 2018, as does the USL-based Nashville SC (also owner by Nashville Soccer Holdings). 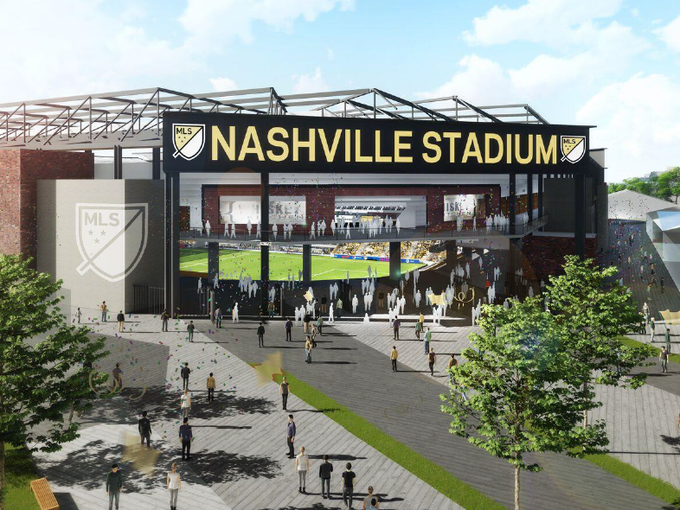 The MLS team could hold off until a 27,500-seat soccer stadium at The Fairgrounds Nashville is completed, or begin play in 2019 at a temporary site (like Nissan Stadium) if the new stadium can’t be completed in time. That decision could be announced as soon as tomorrow, and Garber said an announcement about another expansion team in addition to Miami could come very soon. None of this is a surprise; Nashville has been considered a front-runner to land a MLS expansion team in recent months, and Nashville is considered to be a very hot market. (Or, as MLS Commissioner Don Garber put it in his announcement, a “young” market with the demographics sought by the league.) What is a little surprising is how Nashville bolted from the pack to land the team.In the end, he said, the combination of a strong ownership group, a world-class stadium, strong management and a diverse, soccer-loving population swayed league officials and vaulted Nashville ahead of other leading contenders like Sacramento and Cincinnati. “Nashville was not on our radar at the time,” when groups were making their pitch for an expansion team in January 2017. But, he added, listening to the group’s pitch and monitoring the ownership situation made MLS officials very excited about placing a team in Nashville. “There’s no doubt Nashville is a city on the rise,” Garber added.